You can make a classic modern American desk by simply placing a door on the top of two two-drawer filing cabinets. It is large, simplicity itself to make, and easy to move. It has been a favorite with American students for 40 years. Unfortunately the most common design for this desk has a number of shortcomings that make it unsatisfactory for a low-stress computer desk. The surface is much too high for a keyboard. The desk is too big for most dorm rooms. The filing cabinets are expensive, take up leg room, and who needs two anyway. This design addresses these problems so that any student -- yes that means you -- can make a good, low-stress desk. This third version is can be made any length to suit your floor space and has simple-to-make legs so you have lots of leg room. If you like our fun Freebies, remember we can only keep this Web site open if we sell our Low-Stress Computer Furniture Plans or you follow our ad links and make purchases from our sponsors. Thank you. The five drawings for this desk are within this text. To get the sketches simply send in this little freebie form. At the start of this note is a drawing of the third version of this desk. It shows the front and the underside of the door with wooden blocks and the keyboard drawer. A simple set of legs replaces the second filing cabinet so that you can trim the door to any length to fit your room and giving you more room for your legs. Above is a photograph of a desk in this style. The top is not a simple door but is a panel of hardwood boards instead. Note how all the cables and equipment hide the simple lines of the desk. This sketch show the parts to build the legs. All the parts are easily cut from 1 by 4 stock. The keyboard drawer is large enough for an ergonomic keyboard with the mouse pad beside it. It is a simple shallow drawer mounted on metal drawer glides and hung below the desk top. This sketch shows details of the construction of the keyboard drawer. It is simply made by cutting 5. by .75 inch molding with a hand miter box. The piece lengths are given for this desk. The blocks are cut from .5 by .75 inch rectangular molding with a hand miter box. Eight Positioning Blocks are needed for this desk. The secret is to get a good price on the filling cabinet. A small hand saw and miter box are needed. The cost new is about $20.00. This can be a hand drill or a small power drill. You can use cut off nails for the bits. The angle brackets and drawer guides usually have Phillips head screws. You need a common claw hammer. A small point nail set also helps. You need a simple square. Two draw filling cabinets are valued and rarely found at garage sales. Decent new ones cost about $50.00 at a discount store. Cheap cardboard ones do not work well, neither does a real cheap metal ones without wheeled drawer guides. Sometimes you can get an old, metal 4 drawer cabinet real cheap (like free or $10.00), especially if one drawer is damaged. It can be cut off, but it takes time. The best way is to remove the drawers and carefully mark a straight line at the desired height all the way around the body. This gives you some say in the height of the finished desk. Then you simply saw it off using a hack saw blade wrapped with duct tape for a handle. You want blades with a large number of small teeth. Keep as many teeth as possible in the thin metal by sawing at an angle. This is a great activity for a group of students while watching TV. After the cut is finished, file the rough edge and cover it with narrow strips of duct tape. You use .5 by .75 inch molding to position the filing cabinets, keep the desk top from crushing the cable against the wall, and to frame the drawer. It is commonly available as it is used in sash windows. Using this material means you do not have to have any kind of power saw to make this desk. The molding is easiest cut with a miter box and small hand saw. These cost about $10.00 each new. All the cuts are either 90 degree or 45 degree. Be careful to note if the 45 degree cuts are on the .5 inch or the .75 inch side. The door normally used for this desk are 'Hollow Core'. They are inexpensive and light weight but they only have solid wood around the outside edge. The center cavity of the door is fill of air and cardboard. You can only get nails and screws to grab around the outside edge. The alternative is a 'Solid Core' door. These cost about $20.00 more and much heavier. The sawn edge will be filled but may have gaps. You can also get these doors either covered in inexpensive hardwood or masonite. The hardwood is bland but looks nice if stained and varnished. If you need a desk shorter than the full length of door, you can is cut it off and fill in the hollow core area with a piece of 1-by stock. The cut must be square. You can often have this cut made at the place where you by the door but you must know the exact length of desk you want before you go to buy the door. This cut is best done with a power saw running against a straight edge. You must use a plywood blade with many teeth. The blade should just come through the door. To reduce splintering try placing masking take on both sides of the door, then marking on it, and cutting through it. The central area of a hollow core door must be filled with a piece of 1-by lumber cut to fit. Hold it place in with glue and a few nails from the bottom. The positioning blocks are short pieces of molding with one end cut 90 degrees and the other at 45. For simplicity you can simply make all 8 the same length. The wide side should stand up in the miter box for the 45 cut. Pre-drill the block for #4 finishing nails. This is easily done by cutting the head off a nail and using it for a drill bit. Place the door on the floor best side down. Be sure to protect it by placing in on a clean rug or magazines. Anything trapped under the door will leave a ugly scratch. Place the empty filling cabinet in place upside down on the door. Position it equal distance front to back and one inch from the filled end. Place eight positioning blocks around the corners of the filing cabinets. Place a thin piece of cardboard, like a piece of manila folder, between the block and the cabinet. Attach the blocks with nails and glue. The leg pieces can be cut to length with the miter box and hand saw. One piece needs to be notched. The inside board serves to mount one side of the keyboard drawer guide. The length of the four leg pieces many need to be adjusted to exactly suit your filling cabinet. Be sure to consider the feet in making your measurement. The leg assembly is held together with nails and glue. If you would prefer a keyboard shelf to a keyboard drawer, you can borrow the keyboard shelf details from the fourth version of this desk. If you are cutting the door off to fit your floor space, you may need to size the keyboard drawer to fit. The piece sizes shown in Sketch #3 are for a full size drawer. The easiest thing to do is to cut the pieces to the lengths shown then shorten pieces 1, 2,5,6, and 7. Install two angle brackets to the inside of the leg assembly and two to one separate hanger board. The brackets should be only a 1/4 inch in from the edge so that they will ketch good wood. Stand the leg assembly on the door about 1/4 inch in from the good end. Trial fit the drawer slide and back drawer piece (5) between the hanger board and the leg assembly. Determine if you need to cut it off. Trim pieces 1, 2, 6, and 7 by the same amount. Be careful to cut the bottom square. Pre-drill nail holes in the pieces. Glue and nail the front, back, and two sides into the 'L' shape shown in the cross section. The paired pieces are not the same length but the short one should always be centered on the longer one. Cut the four short beveled pieces about 3 inches long. These look like the position blocks but they are cut with the 45 the other way. Pre-drill these blocks too. Assemble the four sides around the plywood base. Be careful to make the drawer square. The Bottom is held in with glue and brads. The short beveled pieces lock the four corners of the frame. Trim the front of the drawer to cover the guides but not hit the leg assembly or the hanger board. We suggest you spend some money for a good drawer guide. These have steel balls and do not have plastic wheels. Cheap guides work badly. The good ones are called 'Medium' or 'Heavy' duty and cost about $8.00 more. You can make a guide out of the same wood molding as the drawer but it does not work as well. After the drawer glue is dry. Attach the drawer guides to its sides. First use a few screws in slotted holes. Only after adjustment will you add more screws in the round holes. Attach the drawer slides at the lower edge of the hanger board and the leg assembly. You may have to take the guide apart to do this. Reassemble the drawer slides and position the drawer and leg piece exactly were you want it on the door. The front of the drawer should line up with the front edge of the door. Drill holes for the back angle bracket screws and install them. Carefully mark the front of the leg piece and remove the drawer from the slide. Check the position of the hangers and install the front bracket screws. Turn the whole desk over for the first time. Reinstall the drawer into its guides. Check that it runs smoothly and is parallel to the bottom of the door. Tighten all the existing guide screws and add more in round holes. A few extra screws here will keep the drawer running smoothly for a long time. This is particularly important for the Leg Piece where you do not have much material to grip with any one screw. You will want to cut a 1-by piece of wood the size of your mouse pad to put under it. This brings the mouse up to a more comfortable height. The two Cable Protection Blocks are cut from the same molding as the Positioning Blocks but have two beveled ends. Pre-drill and nail them to the back edge of the door. These prevent the door from crushing the computer cables against the wall. If you like, you can add some eye hooks along the back edge of the door. These allow you to tie the computer cables up out of the way. Hand sand all sharp edges. Spend some time on the front edges of the keyboard drawer so that the edges feel comfortable in you hand. Round the four door corners a little too. The door is usually simply hand sanded, stained, and covered with two coats of polyurethane varnish. Several applications of stain may be needed to get the edges of the door to be as dark as the top. Everything below the desk top is usually stained or painted a dark color often to match the filing cabinet. Congratulations, you have complete a good, low-stress computer desk. The desk you made could easily be in use by a series of students for many years. 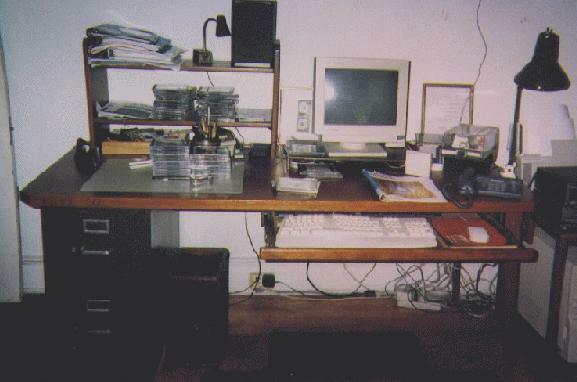 We need a picture of your desk with your name below it for our Web Site. This will show students everywhere that they can build their own low-stress computer furniture. Thanks again for visiting our Web site.